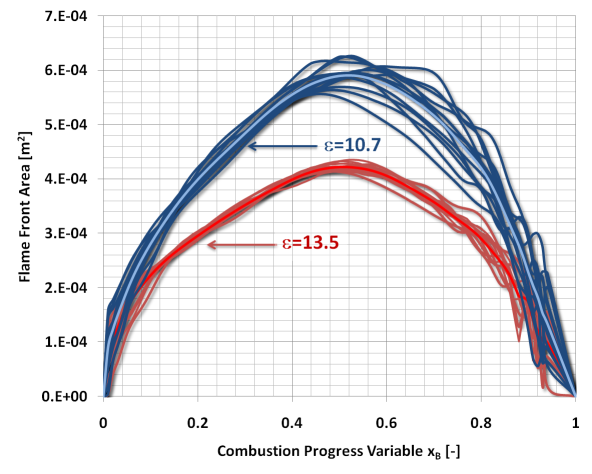 The capability to accurately predict combustion behavior and emission formation during the early stage of new engine developments becomes increasingly important. Therefore CFS has developed predictive phenomenological models to analyze combustion behavior and emission formation. 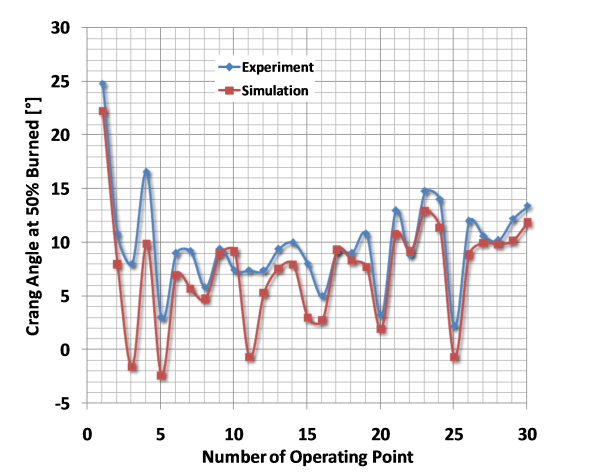 These models are able to capture variations of the boundary conditions and are therefore highly suitable to investigate different operating conditions and engine designs. In many cases lots of unknown parameters exist especially during the early stage of development or during redesign. The optimization tool can be applied simultaneously to optimize engine performance automatically meaning that a powerful combination of tools can be applied. 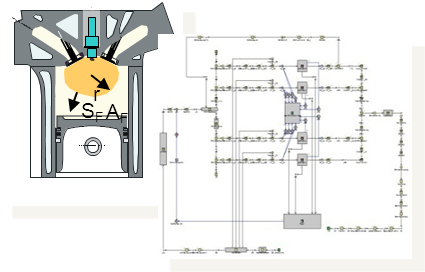 A newly developed advanced flame propagation model cfs.afpm is used for premixed combustion applicable in cycle simulation tools. This model was tested successfully for CNG and gasoline engines. The turbulent flame propagation is described in a phenomenological way, including sub models for the laminar and turbulent flame speed considering in-cylinder pressure, temperature, amount of exhaust gases, equivalence ratio and turbulence. The turbulence model is accounting for the turbulence generation due to the intake, injection, squish flow and the change of turbulence intensity due to density changes and dissipation. The geometrical properties of the combustion chamber are described by a flame front area function, which is a fingerprint of the combustion chamber geometry. The phenomenological model can be used in two ways: On one hand in “backward” applications the interaction between flame and walls can be studied, on the other hand in “forward” applications the burn rate and therefore cylinder pressure, temperature, efficiency and many other relevant quantities can be predicted. Backward Application: Based on the measured pressure traces the flame wall interaction can be estimated. 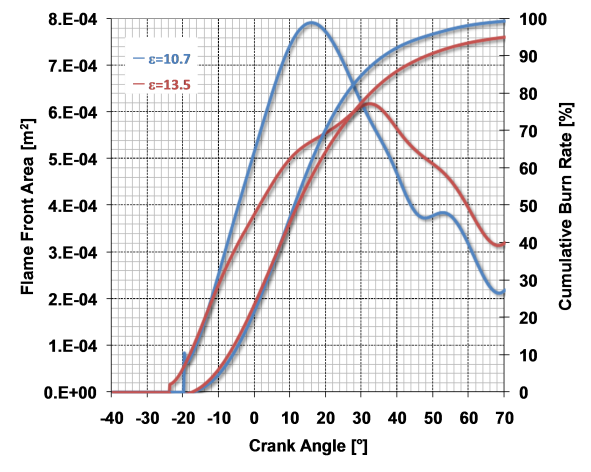 The following figure shows the experimenally determined burn rate curves for two different combustion chamber designs and the corresponding calculated flame front areas. It can be seen, that the curves cross around CA=-13.4°. This means that the flame propagation is restricted for the engine with the higher compression ratio (which was achieved through fillint the piston bowl). This point has been further analysed and it was observed, that the flame front touches the piston surface. This example shows the “backward” calculation. The following pictures show the spherical flame in the CAD drawing of the combustion chamber. The flame radius was calculated based on the computed flame front area. 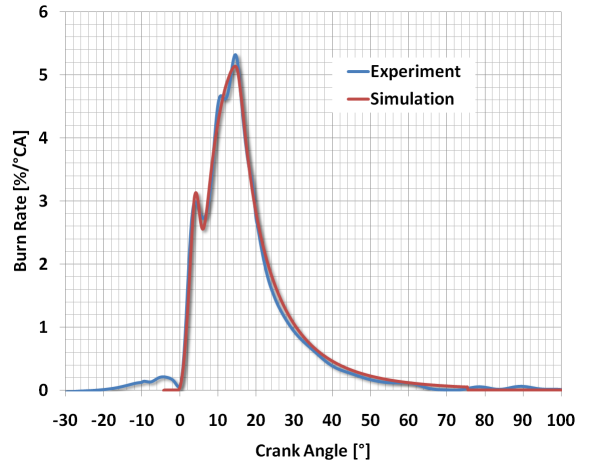 The following graph shows the comparison of the experimentally determined and computed crank angles at 50% burned. This example corresponds to the mentioned “forward” application. The computations have been performed with a cycle simulation code. A good agreement was observed for the investigated operating points. The phenomenological diesel combustion model describes first mixture formation where sub-models for spray formation, evaporation and air-fuel mixing exist. The ignition delay considers the physical and the chemical ignition delay. Fuel is allocated between premixed and diffusion combustion. The premixed combustion is modelled by a flame propagation approach where diffusion combustion is modelled by mixing controlled combustion. The two regimes, premixed and diffusion combustion, are finally superposed to define the final burn rate. Therefore, combustion and flow solutions GmbH uses such models during design phase and for testing new concepts. The following example shows a variation of Start of Injection for a diesel engine. 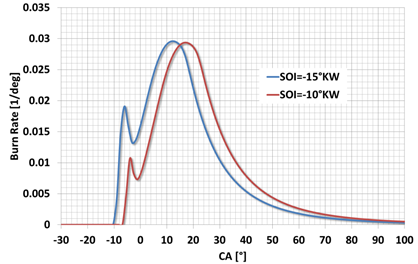 The soot model contains of a production and an oxidation term in different lambda regimes. During diffusion combustion a 3D lookup table based on Akihama (SAE 2001-01-0655) is used to consider soot production where soot oxidation is computed based on available soot mass, oxygen concentration and on the characteristic inverse mixing time. The NO model uses an extended Zeldovich mechanism where virtual combustion zones accounting for different air-fuel-ratios and depending on combustion progress is used. Both emission formation models are continuously improved and an updated version will be presented soon.